It is oddly comforting to me that people two thousand years ago had the same money worries I have. Of course, it’s even more comforting to learn what to do about them. I heard “Consider the lilies” many many times growing up, but until this year, I didn’t understand it. And I certainly didn’t live it. But I do now. And the result is, well — miraculous. In 62 days I went from bankrupt to bank-full. With the help of a lily. Here’s what happened. 2009 was an astonishing year for me–and for so many. Writing Down Your Soul came out January 1. The next 11 months were filled with teaching, speaking, promoting, and traveling. Invitations trickled in at first, but by summer they poured in. I said yes to every one because the deal I have with Spirit is: Spirit sends the invitations; I show up and spread the joy of deep soul writing. It’s been a prolific relationship. As I typed this list for a book proposal, I thought no wonder I’m exhausted. But it wasn’t only my body that was depleted. My bank account was empty, too. By the end of last year, it looked like the only solution was bankruptcy. Does that surprise you? Here’s the economic reality of being an author, especially a new one. That old image of a writer on a “book tour” is a fantasy. Unless you’re a celebrity or show up regularly on bestseller lists, your “book tour” consists of you begging friends to let you visit. Then, you research the area. You get yourself invited to speak. You cover your travel. You create the flyers. You market the event. With each appearance, I built a larger and larger community for Writing Down Your Soul, but I also dug a deeper and deeper hole in my finances. In December, I faced facts and with the help of my friend and real estate genius, Jane Mak, I made an appointment to see a bankruptcy attorney in February. On the periphery of my Intention Mandala, I drew images of what I want. But at the center, I drew a lily to remind myself to do the six things that will create the conditions that will manifest all that I want. Or, to use Jesus’ words, how I will “set my heart on the kingdom” — the vibrant living presence of Spirit. Looking at the lily every day reminds me to focus not on what I want, but on how I choose to live to express and fulfill my soul’s divine purpose. It’s a paradox, I know. By not focusing on what I want, I get what I want. Have you noticed hat the universe loves paradox? It would be nice if someone told us in advance that profound spiritual truths always come in a box marked, “Warning! Paradox Inside.” But I guess we all get to discover that for ourselves. Since January 1st, I’ve been living my “Lily Life.” I wake every morning whispering “I am a lily” and like a flower, turn my face to the Light. Feeling the kiss of Spirit on my cheeks, I bound out of bed with a grin on my face, delighted to embrace my day. Then I scoot into my office, say my prayers, and get to work. If you snapped a picture of me working in my office today and compared it to a picture of me working in my office last year, you wouldn’t see anything different — unless you noticed me smiling at the lily on my Intention Mandala several times a day. Driving home, I had a little chat with my beloved Voice. “Thank you for that appointment,” I said. “Turns out I’m not bankrupt after all. I am bank-full. And you know what, I love this feeling. I am thankful to be bank-full.” I giggled. “I am thankful to be bank-full!” I sang my new mantra all the way home. Now, whenever I receive or spend money, I say, “I am thankful to be bank-full!” For the first time in my life, I laugh as I pay bills. I have the atrocious divorce, discover deep soul writing, and pass it on to you. I forgive my husband, experience an eye-popping miracle, and start teaching forgiveness. I discover how to write a book by plugging into “The Intersection” and now teach creatives how to Plug In! I discover the joy of mystical poetry and now everywhere I go, people fall in love with Hafiz, the great Sufi poet. So, I guess it makes sense that I had to step into the pain and panic of feeling bankrupt in order to be willing to explore the spiritual paradox of getting what I want by focusing on creating the conditions that lead to the delightful state of being bank-full. And please understand, when I say bank-full, I am not talking just about money. Money is delightful, but prosperity is so much more. It’s friendship, growth, freedom. It is loving relationships, a peaceful home, and joyful work. It is in a word — love. Love of life, love of others, love of Spirit, love of who you are and why you’re here. The feeling of being bank-full is the feeling of love overflowing onto your hands, your heart, and yes, your bank account. Well, the deal I have with Spirit, don’t forget, is I say yes. Yes to having the experience, yes to plunging into the paradox, and yes to sharing what I learn in the process. So, now it’s time say yes to sharing the profound adventure of “considering the lilies” and creating a magical, joyful, abundant life. Would you like to join me? 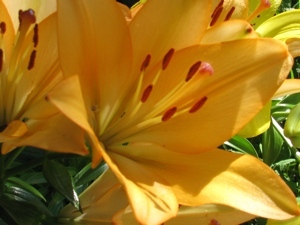 I created the “You are a Lily” telecourse to share this magical co-creative process with you.